Local musician Scooter Pearce was involved in a near fatal car accident and needs assistance for medical expenses. 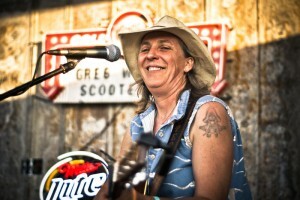 Friends of Scooter Pearce are having a benefit for her at the Becker Vineyards Tasting Room Verandah on Saturday, August 13 from 7 p.m. until 10 p.m. The admission fee of $20 (includes live music, hors d’oeuvres, and 3 wine samples) goes toward her medical expenses. Musicians Jon Hogan, Maria Moss, and Sol Patch will perform live. Scooter Pearce will also be present signing her musical CDs. There will also be a silent auction. Becker Vineyards is located 11 miles east of Fredericksburg, 3 miles west of Stonewall, off US Hwy 290 at Jenschke Lane. For more information contact: Kay or Nichole at 830-644-2681 x 302.